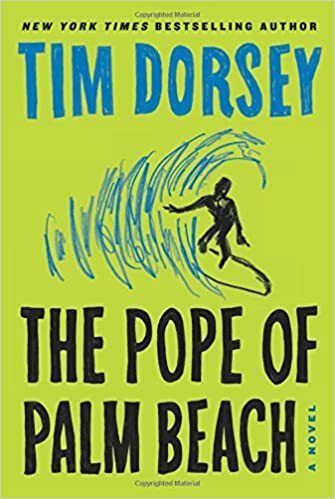 The Pope of Palm Beach is the 21st in the Serge A. Storms series of novels by New York Times bestselling author Tim Dorsey. In this installment, Serge and Coleman are on a whirlwind “literary tour” of Florida as they visit historical sites of interest for many authors who at one time or another have called the Sunshine State home. The tour does include the usual “side trips” to correct an injustice here or there and culminates with Serge in his hometown of Riviera Beach as he seeks to locate the last known address of his favorite author. Little does he know that Kenneth Reese is alive, if not completely well, and in dire need of Serge’s special brand of justice. As I mentioned, he is a serial killer, but he is so darned creative it is hilarious the things he comes up with! While this is the 21st in the series involving the loveable Floridaphile serial killer Serge and his stoner sidekick Coleman, this is not the first one I have read. In fact, I was first exposed to Serge when I moved to Texas for a short time in 2008 and 2009. At the time I left, I was so sick of Florida, hurricanes and the general nutjobs that inhabit the state that I was dead set on never coming back. Tim Dorsey changed that. While reading these books, I found myself in tears laughing at the very things that used to annoy me and I became so homesick for the Freakshow state that I jumped at the first chance to come back. To date, I have read every installment in the series, some of them twice, and Dorsey is one of the very few authors whose new books I drop everything for when they are released. I’m pretty sure that the main thing that drew me into these books aside from the whole serial killer thing is the sheer amount of Florida history that Dorsey packs into each new adventure. At first, I thought that he was making some of the weirder stuff up, but then I started researching and soon discovered that all the historical tidbits, festivals and weird current and former residents are 100% real. The novels alone could easily read as a “what to see in Florida that’s not Disney, I-Drive, and the Beaches” type tour guide and I understand that many a fan have actually used some of the prior novels to embark on Serge themed “night tours” of their own. While Dorsey’s brand of humor is not for everyone, if you like madcap comedy, sometimes crude humor and murder all set in the backdrop of paradise pick up any Tim Dorsey novel. You will not look back.